What is the Coleman internship? The Coleman internship is an exciting way for undergraduate students in history or pre-law to gain real-world experience doing important research for the Society. 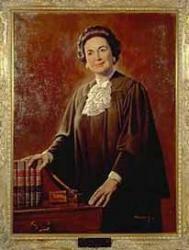 The program was established in 1998 to honor Judge Creighton Coleman and his wife, Justice Mary Stallings Coleman, the first woman to serve on the Michigan Supreme Court. The Society has had fifteen Coleman interns since it was established. In that time, these bright young minds have contributed enormously to the Society’s work. Please see the brief biographies below to learn more about the projects in which they have been involved. For more information about the Coleman internship, please contact Carrie Sampson, Society Executive Director, at 517-373-7589, or by email at carriesampson@micourthistory.org. The first Coleman intern, Jill Moore, performed the research and writing for the Society’s first book, the Michigan Supreme Court Historical Reference Guide, published in 1998. The 1999 Coleman intern, Scott Noto, researched general historical information about the Michigan Supreme Court for a booklet entitled “A Brief History of the Michigan Supreme Court.” It was published in early 2001 and forms the basis of the information here. In 2001, Coleman intern Melissa Witcher researched several topics including the Michigan Supreme Court’s role in the Civil Rights Movement. This research resulted in the creation of a PowerPoint presentation with accompanying speech. The presentation is available by clicking here. Henry Lau was selected to be the Society’s 2002 Coleman intern. His work involved indexing the Society’s Oral History collection and making both the text and audio files available online. Henry completed his portion of the Oral History project in May 2002 and Michelle Martin picked up where he left off. She continued with the digitization of the audio files, which are available via our website here. Allyson Miller, the 2003 Coleman intern, was selected for her academic background in pre-law and history, with a specific focus on Women’s Studies, to complete the Society’s Women and the Law Project. To view the completed project, click here. Heather Weeks, the 2004 Coleman intern, worked on two major projects–the first was to compile materials for the Index to Special Sessions book and to create a bibliography of research resources, newspaper articles, photographs, and other materials relating to the Michigan Supreme Court at the Library of Michigan and the State Archives. In 2005, Caroline Zickgraf, a junior at Michigan State University, assisted in the development of the program for celebrating the 200th Anniversary of the Supreme Court of the Territory of Michigan. She also completed the bibliography of research resources about the Michigan Supreme Court. In 2006, the Society selected Lance Phillips to organize the information for two new web pages for the Society: the history overview (referencing “A Brief History of the Michigan Supreme Court”) and a timeline of important events in the history of the Court. During the summer, Lance researched the ways the court’s justices have gotten on the court and the ways in which they have left the court, for the On & Off the Court chart, available here. The 2007 Coleman intern, Laura Langolf, worked on developing a list of “firsts” among territorial and state supreme court advocates, preparing biographies of some of those advocates, and researching the history of qualification requirements to practice before the early courts. This work would eventually become part of the Advocates Guild. Brittany West was the 2008 Coleman intern. She worked on gathering visual and supporting materials for the Society’s significant cases project, which came to be known as the Verdict of History, including copyright releases for the images. Stephanie Schnelz was selected as the 2009 Coleman intern. Stephanie worked on collecting data and other research related to the first women justices for a proposed exhibit about the first women of the court, planned for the Hall of Justice Learning Center. Jacob Yaeger served as the 2010 Coleman intern. His project was to conduct new research on the Michigan Supreme Court justices for a revision to the Michigan Supreme Court Historical Reference Guide. Andrew Paulsen, the fall 2010 Coleman intern, implemented a new membership database to facilitate better communication with the Society’s members. In 2012, Jamie Crist was chosen to be the Society’s summer intern. Jamie’s project was to provide contextual research for the planned Women of the Court exhibit. She conducted an in-depth study of when each state’s supreme court had elected or appointed a woman as justice, when or if there had been a woman who served as chief justice, and which state’s had a female majority on their supreme court. Her work is available as a Wikipedia page here. Kevin Cunningham, a senior in the history department of Michigan State University’s Honors College, has been selected as the Society’s Coleman intern for spring 2015. Kevin will be researching the history of the Michigan Supreme Court’s court reporter, clerk, and commissioners’ offices. He is especially interested in the early court reporter’s office since three reporters went on to be elected to the Michigan Supreme Court.